Using your hand to grasp a pen that’s lying on your desk doesn’t exactly feel like a chore, but for robots, that’s still a really hard thing to do. 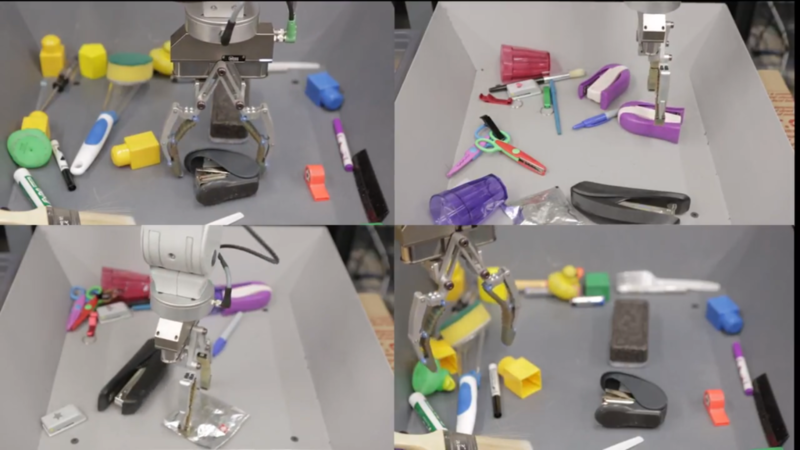 So to teach robots how to better grasp random objects, Google’s research team dedicated 14 robots to the task. The standard way to solve this problem would be for the robot to survey the environment, create a plan for how to grasp the object, then execute on it. In the real world, though, lots of things can change between formulating that plan and executing on it. Google is now using these robots to train a deep convolutional neural network (a technique that’s all the rage in machine learning right now) to help its robots predict the outcome of their grasps based on the camera input and motor commands. It’s basically hand-eye coordination for robots. Google’s researchers say the average failure rate without training was 34 percent on the first 30 picking attempts. After training, that number was down to 18 percent. Still not perfect, but the next time a robot comes running after you and tries to grab you, remember that it now has an 80 percent chance of succeeding.